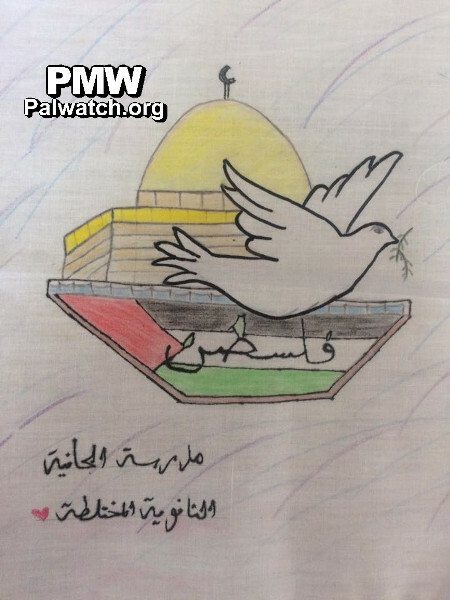 "Innocent drawings express the feelings of children of #Palestine"
Fatah has posted several children's drawings on Facebook. 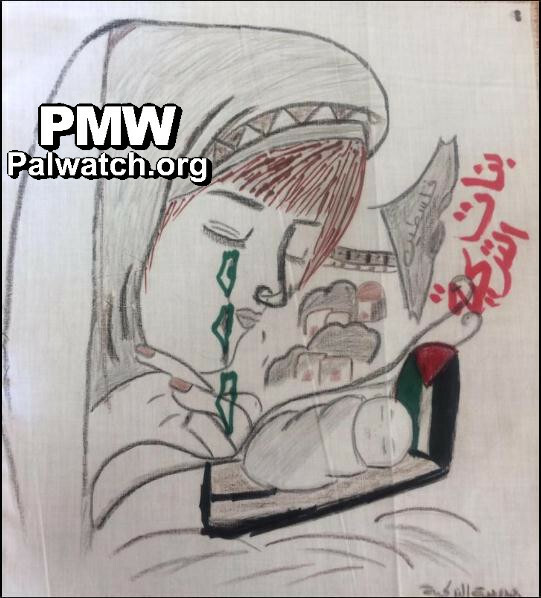 The drawings clearly show the success of PA and Fatah brainwashing children to believe that Israel only seeks to harm them, violence is good and that all of Israel really is "Palestine." 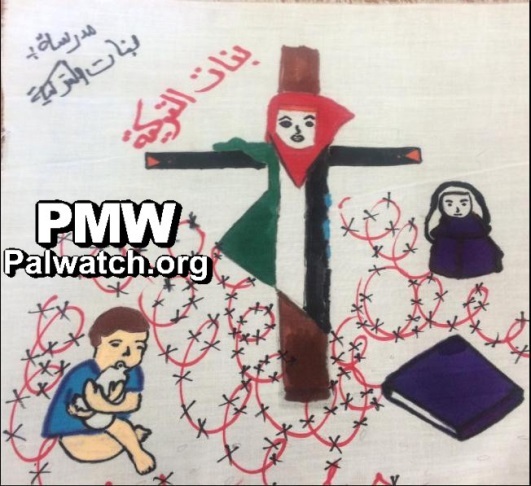 Labeling the drawings "innocent drawings" that "express the feelings of children of #Palestine," Fatah posted the drawing above showing Israel, as indicated by a Star of David, eating a Palestinian body wrapped in the Palestinian flag. Blood is seen coming from the body, and a glass of blood is next to the plate. 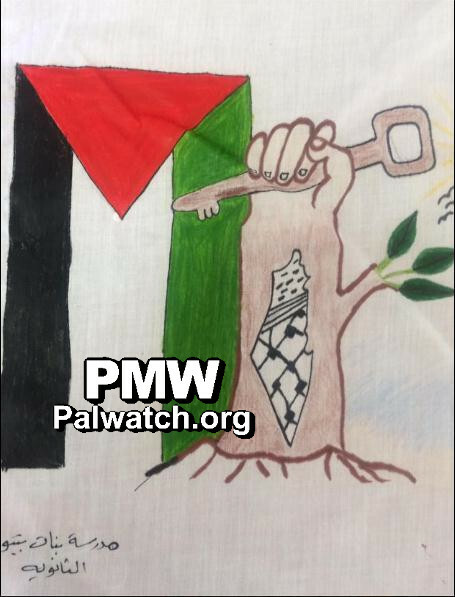 Another drawing by a Palestinian child showed a crucified woman wearing the colors of the Palestinian flag, with her body in the shape of the PA map of "Palestine" that presents all of Israel as "Palestine" together with the PA areas. The crucifixion also repeats the analogy that Palestinians are Martyr victims like Jesus. 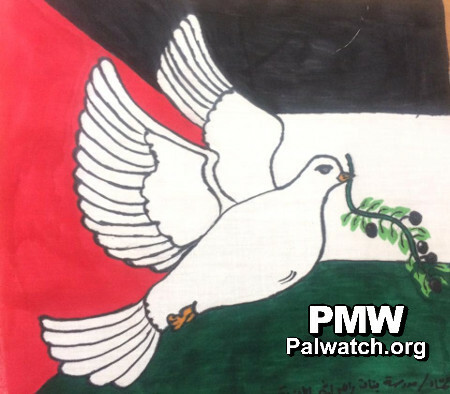 Yet other drawings showed support for violence as legitimate means of Palestinian opposition to Israel. 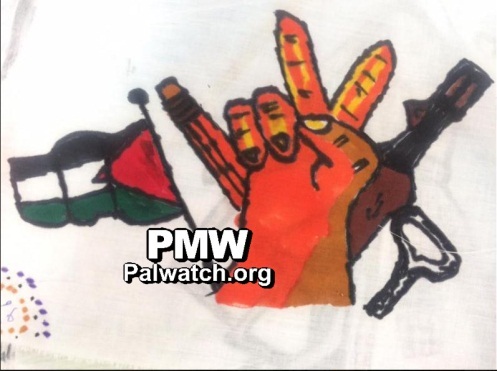 One child drew a Palestinian with a slingshot, another drew a hand with a rifle (see below). 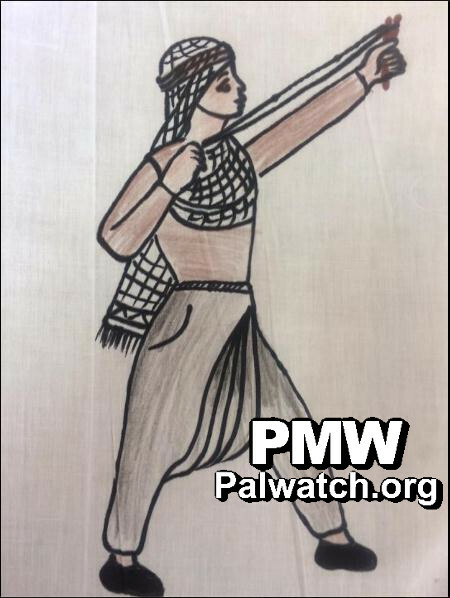 These drawings echo the PA and Fatah's encouragement of the use of violence against Israel and their glorification of terrorists as heroes. 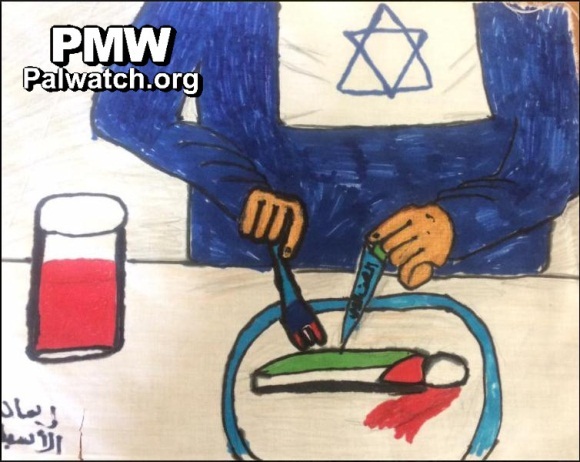 Palestinian Media Watch documented that summer camps organized by the PA Ministry of Education and the PLO educated children to see terrorist stabbers as role models. Other drawings repeated the world view that all of Israel is "Palestine," showing the PA map of "Palestine" which completely erases the existence of Israel and its legitimacy (see below). This message is repeated endlessly by the PA and Fatah. Children are told that "it will all return to us" on kids' TV programs. The PA National Security Forces regularly post photos from all over Israel presenting the places as "Palestine," and even crossword puzzles portray Israeli cities as "occupied Palestine." 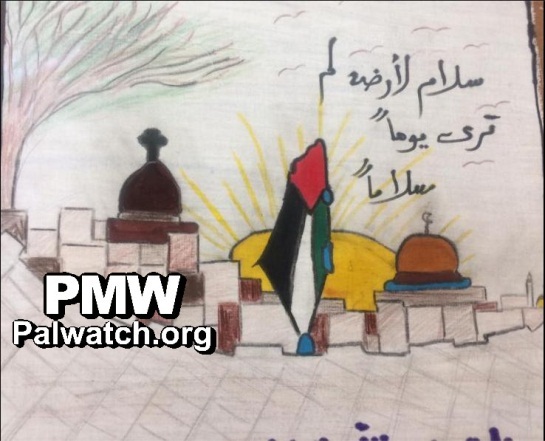 The PA's exploitation of Palestinian children's innocence is precisely what PMW has been highlighting and warning about for years. The PA and Fatah repeatedly demonize Israel as a monster whose only intention is to harm Palestinians. Israel is "Satan with a tail" on PA TV children's programs and "Satan's project" fighting "Allah's project" in sermons delivered by Mahmoud Abbas' advisor. Similarly, Palestinian terrorist murderers are being portrayed as innocent victims of alleged Israeli "executions." A few of the drawings included doves, some calling for "peace and freedom." A major focus of Palestinian Authority policy today is to demand freedom for all imprisoned Palestinian terrorists including murderers. One drawing specifies "Freedom for Ahmad Manasrah" - a child terrorist who stabbed and critically wounded two Israelis, one of them a 13-year-old boy. 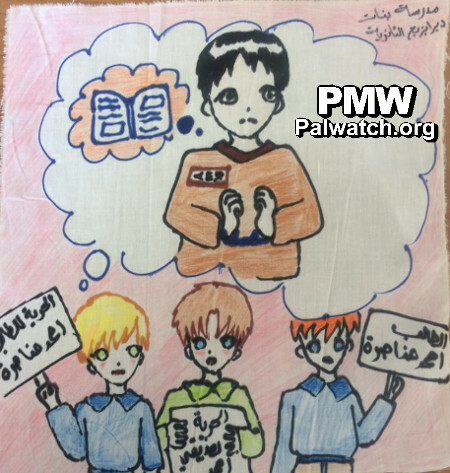 Text: "Freedom for Ahmad Manasrah"
"Al-Janiah High School for Boys and Girls"
The PA and Fatah's indoctrination of children to hate and violence, including their naming schools and sporting events after terrorists, perpetuate the conflict and are one of the greatest impediments to peace.